There has been much sturm und drang lately about the ramifications of direct-to-consumer (DTC) genetic testing. Depending upon your point of view, either it’s the end of the world as we know it, or it’s a door opening into the future. These opinions seem to be based on, well, opinion, rather than a careful weighing of evidence – perhaps because there is no evidence. A recent encounter with a patient who utilized DTC testing has forced me to confront my thoughts on this issue. I am purposely avoiding mentioning the name of the company – the company does not need free advertising, and the specific company does not matter to the issues at hand. I have modified the patient’s name and some personal details to be absolutely sure that anonymity is maintained. Zoe, a bright and articulate 30-something Ashkenazi Jewish woman, called me on the advice of her primary care physician. She had no specific health problems or family history concerns, but likes to keep herself educated about health matters. She maintains a healthy life style and has long been interested in learning as much as possible about her disease risks. She does not have children, but would like to start a family in the near future. She came across the website of a DTC company that happened to be offering a special deal on their genetic screen to celebrate DNA Day. So, she and her sputum took the plunge. The results were a mish-mash of not-particularly-helpful information such as a slightly higher risk for diabetes, slightly lower risk for cardiovascular disease, wet ear wax, and curly hair (which hung plumb-straight to her shoulders). But she didn’t call me to discuss her ability to smell asparagus metabolite in urine. Instead, right there, nestled among the results of her Measure of Intelligence and her Longevity, was a deleterious BRCA mutation. What does this mean, she asked me over the phone? I suggested she make an appointment with me or, if she preferred, she could ask the DNA testing company if they had certified genetic counselors on staff who could work with her. The company offered her a list of genetic counselors in her area, but did not themselves employ genetic counselors. A few days later, she was in my office. Creature of habit that I am, I began with a pedigree, but no matter how hard I shook the family tree, the only cancer that fell out was a late onset prostate cancer in a distant relative. Not surprisingly, one side of the family contained very few females. She peppered me with questions about cancer risks, screening, and prevention. She took it all in, duly taking notes and asking appropriate questions. Although the cancer risks were concerning to her, she was reassured by the availability of options to reduce her cancer risks or to improve the chances of detecting breast cancer at an early stage. She was not ready at this stage of her life to make surgical decisions. She had alerted her family to her results, and they planned to have a family meeting after she had met with me to discuss what they would do next. In short, it went pretty much like your average BRCA Positive Informing Session. She was quite satisfied with her dealings with the DTC company, and was planning on encouraging others in her social circle to consider testing as well. I sensed no significant emotional distress beyond what you would ordinarily expect. The lab is CLIA-approved, and out-source the BRCA Ashkenazi Panel to a well-known lab. Although the patient was concerned that sputum was not as accurate as blood, I assured her that I saw no need to repeat her testing unless she wanted independent confirmation for her own peace of mind. But this would cost her about $600, and since there was no family history of cancer, it would not be covered by her insurance. The DTC lab charged her far less than that, and in her view, she received more information for less money. For Zoe, DTC testing was a very positive experience. She received valuable information that could very well wind up saving her life. With no family history of cancer, she would not have started breast cancer screening for nearly another decade, and would likely otherwise never have pictured a risk-reducing salpingo-oophorectomy in her future. As an aside, I think it is a forceful example of the potential advantages to offering BRCA screening to all Ashkenazi women (yes, I recognize the possible downsides and intricacies too). It also partially counters the argument that we can tell patients more from pedigrees than we can from DNA tests. Zoe was the ideal person to utilize DTC testing. She is bright, educated, and eager to improve her health and avoid disease. She had the financial means to pay for testing and counseling (neither of which were covered by her insurer). She is emotionally stable, and the information, while surprising to her, was not particularly upsetting to Zoe or (by her report) her family. While there could certainly be long-term psychosocial issues, my gut sense was that she was not at high risk for serious problems. Of course, one could easily imagine patients who might react very differently in this situation. My criticisms of the experience are mostly minor. The written information provided by the lab about the implications of BRCA results was fairly minimal. I tried to contact the lab to ask technical questions, but the lab’s website does not offer a readily apparent Contact Us section. It took some digging around to find a general email address, and then it took the lab 2 days to reply to me. If labs and genetic counselors are going to work together, labs need to improve their communication with health professionals. The lab rep insisted that the results were not intended for medical purposes. But, come on, BRCA results can be a matter of life and death. DTC labs need to step up to the plate and clearly acknowledge that at least some of their results have very important implications for medical care beyond telling someone to exercise more, eat less, and hold your nose when you urinate after eating asparagus. Zoe also learned that she is a carrier for a few potentially serious genetic diseases that could affect her reproductive decisions (which she found helpful). There was also the usual collection of “Self Evident Why Did They Bother Testing For This Stuff” traits like photic sneeze response, odor detection, pain sensitivity, etc. While it is easy to make fun of these, in spirit, the information is not very different than the type of information that couples seek from sperm and egg donors when going through assisted reproduction. We need to report our experiences with patients like Zoe as case reports and with larger qualitative and quantitative studies. We have much to learn, and it can help inform policy decisions, patient experiences, and professional debates. We should not reject DTC testing outright; there are situations where it in fact it may be quite appropriate. Until we study the phenomenon, we have no right to form extreme opinions about it. Without information, it’s a an argument, not a debate. Genetic counselors are sensitive to the psychosocial ramifications of genetic disease. But if we insist that everyone who has a genetic test first see a genetic counselor, are we creating an aura of specialness and mystery about genetics that can be a factor in the development of psychosocial sequelae? Should we be setting aside genetic testing from other medical tests and treating it as SOMETHING VERY SPECIAL? Perhaps for some patients, genetic testing is not such a big deal, but if we insist that it is a big deal, we might be contributing to some of the very psychosocial problems we are looking to minimize. I would like to hear from other genetic counselors who have worked with patients who have gone through DTC testing – the good, the bad, and the ugly. I had a woman come see me with her two teenage children because of the following. The father had genetic testing through a cardiology and found to carry a dominant mutation for hypertrophic cardiomyopathy. They never saw a geneticist or GC. The family wanted to test the children and found an online DTC company that claimed to test for cardiomyopathy. To avoid going through insurance the family bought the DTC kit and the kids provided saliva. According to the test they were not found to have any mutations. However, one daughter had heart palpitations and so the parents spoke to the pediatrician about the fathers history and the genetic test they did. The pediatrician said to come see a GC. I saw the CLIA approved test…yes it tested for cardiomyopathy….yes they were negative…but No it did not screen the gene the father had a mutation in. How was this woman supposed to know that there are so many genes that cause susceptibility to cardiomyopathy? so we tested her children for the known mutation and one daughter had the mutation. The DTC company gave them hope and later confusion. There was no disclamer of other possible genes that cause cardiomyopathy. Terrible experience. I had a slightly similar experience with a different outcome. My patient with early onset breast cancer and a significant family history of breast cancer did testing through a DTC company. She reported to her physician and surgeon she was negative, and was told she has an average risk. However, a curious physician asked to see the actual copy of the test results, and saw a report that was not from Myriad and called me. My patient had multisite testing from the DTC company (along with a slew of other things). The report details did state that these mutations tested are primarily found in individuals with A.J. ancestry, however this was all a part of an almost 20 page report of results. My patient has NO AJ ancestry. We did the comprehensive BRCA test, naturally, she’s positive, and it was a bit of a mess to clean up. She was a smart lady, who just happened to be going through a cancer diagnosis and chemo and didn’t feel like reading all the details of a 20 page report and interpreting them. Maybe this situation was her fault, but I’m leaning towards thinking it was not. If someone wants to spend their money on DTC testing I’m happy to talk with them about it, I’d rather educate them than stand in their way, but I’d also like to make sure they’re getting what they’re looking for! Bob, you bring up some interesting points and we certainly need to consider all of the pros and cons of DTC before deeming this means of testing good or bad. It is probably more accurate to say that it, just like conventional testing, has both risks and benefits; how those shake out in the long run is really the point in question. I would caution you, however, from deeming this a ‘positive experience’. Perhaps it would be more accurate to weigh in with this patient 1-, 5- and 10-years down the line to see how she fares after being treated like the very high risk patient she now apparently is. She may then share stories of high risk breast surveillance, anxious care givers urging prophylactic surgeries, ambiguous MRIs, biopsies, sleepless waits for pathology reports and even dating woes, life insurance rejections, and the list could go on. For the patient who receives full informed consent before embarking on the genetic testing path, these things are still hard but are not a complete surprise. I wonder if your patient will still consider this experiment a success a few years down the line. 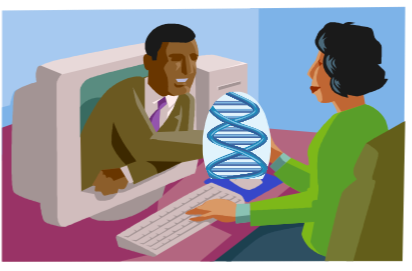 Genetic counselors provide a valuable service, providing information. If I need heart surgery, the doctor explains the surgery, the risks and benefits, and provides follow up care. With DTC testing, who provides information about the test, where is the discussion of the risks and benefits, and why aren’t there individuals who provide follow up care? One look at the discussion boards of a DTC website will find that these consumers need guidance as to what information the tests provide. Your patient was lucky enough to have a physician that referred her to you. What if she hadn’t? Would she still be left with results she may not be able to understand? Who would provide her with the recommended screening and management options? I imagine there would be much outrage if there were DTC companies offering inexpensive heart surgery without discussing risks and benefits, explaining the procedure, or providing follow up care. I think genetic counselors need to continue to be concerned about how genetic services are being administered. Very interesting, just the sort of reason that it should not be regulated out of existence – DTC, you choose, you pay (much less) and learn things that your doctor can’t tell you and your insurance won’t pay for. If it was me I would repeat the BRCA test though (I would repeat it even if it was Myriad that produced the positive result) – maybe I am too cautious or maybe I have worked in commercial labs! Anyway, I find it odd that with the DTC test evidence that the insurance wouldn’t pay for a “proper clinical test”, even without family history. Apart from being the ethical thing to do it would also be the commercially wise choice (unless the decision is based people changing insurance companies before long term risks become actual medical problems). Keith’s advice is worth repeating: DTC genome scans aren’t designed to be clinical tests, and shouldn’t be treated as such. And I hate to say it, but telling this woman that she doesn’t need re-testing – despite clear advice from the DTC company stating that the results are not intended to be used for medical purposes – seems to be to be risking a pretty expensive law-suit. DTC genome scans should be treated as substantially increasing the probability that a specific mutation/variant is present, but not definitively confirming it to clinical standards. Very interesting and thoughtful comments. Jeanette and LT report 2 DTC experiences that were very different than my patient’s experience. We need to keep on collecting the GBU (good,bad,ugly) experiences so we know the nature and extent of the pros and cons of DTC testing. Any G might be offset by too much BU. But we will not know if that until we have more data. And if we have lots of data, we can take it to the DTC companies and policy makers so practices and recommendations can be adjusted accordingly. Ellen’s comment about future problems my patient may have is a good one. Although in this case I don’t suspect that the patient will regret her decision even in the face of screening anxiety, I very well know I could be wrong. But we also have no data to show that genetic counseling improves patient’s long term coping with their decisions, so we can’t say for sure that patients who have seen a GC are less likely to regret their decision about testing. We really need to conduct these long term studies. In terms of repeating the test, I want to clarify that the BRCA testing was a separate assay from the DTC genome scan, and was shipped out to a well known and respected lab. If it’s your practice to repeat all positive tests no matter which lab runs a test then continue with that policy. But if that’s your approach, then you should also repeat all negative tests. False negatives are just as devastating as false positives, though in different ways. Seems like a very big expense with uncertain benefit. On the issue of retesting there are several factors. a) In this particular case we have the identification of a serious mutation which will alter the persons life, may lead to prophylactic surgery and will have consequences for the family. The seriousness of the consequences influences the decision to retest or not. b) The quality of the lab is important but, as Daniel says it’s not intended for medical use – so you use it medically at your own risk. It’s not clear what you mean in your comment though – a separate lab OK but was it part of the same DTC service, as it would appear to be from the article (and the lab rep said it was not intended for medical purposes). The debate about whether the test should contain this sort of information and still be allowed to be not intended etc is too long for here, and not relevant. At the moment it’s a fact – not a clinical test. c) The individual has no family history – this is unusual for BRCA mutations and is in itself a reason for a retest. Repeating every positive test would not be necessary – an error in a SNP that has a weak association with diabetes will not be a catastrophe, any error in a serious disease SNP could be. The issue of false negatives is very important – in fact more important than false positives. The latter will cause anxiety until confirmed to be false, the former will in many cases lead to the development of a deadly disease that could have been prevented. It’s difficult to know what action to routinely take in the absence of solid data on the prevalence of errors. If there was a strong family history and a negative BRCA result there is an indication for a retest – in the end, it’s like any test and is an individual judgement – weighing up all the evidence and the consequences of the result in hand, is a retest necessary. But just to reiterate, in this case, a non-clinical test was used and Daniel’s first paragraph says the rest.